He may be more than a century old but Hafeezullah still goes to work every day. With the aid of a cane, the wizened white-bearded centenarian tends to his fields in Pakistan's hauntingly beautiful Neelum Valley just as he did when Britain still ruled this part of the world. Pakistan was recently named by the UN as one of the worst countries in the world to be for an old person in a report that cited insecurity and lack of freedom for those over 60. 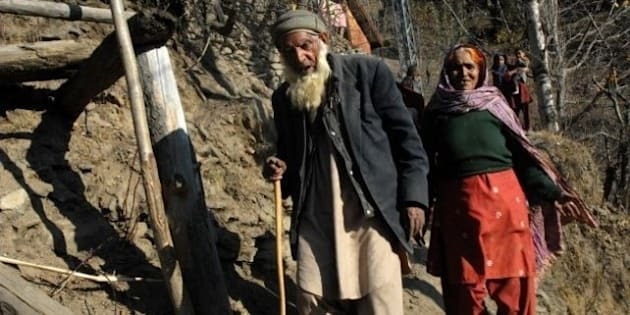 But a dozen or so centenarians like Hafeezulah living in a remote region of Kashmir are bucking that trend, putting their longevity down to their simple mountain lifestyle. Situated in the Lower Himalayan Range, the Neelum Valley is formed by a 200 kilometre (124 miles) long river and is home to some of the most spectacular scenery on the planet. Craggy, snow-peaked mountains, waterfalls and green pastures surround the village of Chattah where AFP met with around a dozen men and women claiming to be at least a century old. Hafeezullah says he is 132, which would make him the oldest person in the world -- although Pakistan's National Database and Registration Authority (NADRA) says he is a comparatively more youthful 107. A slightly built man with a face as jagged as the mountains surrounding him, he said a healthy diet of mainly fresh produce and occasional meat was the reason behind his longevity. He has lived through the days of British India and witnessed Partition but says the thing he remembers most fondly is the low cost of living during his youth. "We used to eat vegetables and pulses. We dumped the dried vegetables in land during the winter season and then dug them up and ate them in summer," he said referring to the natural system of freezing produce under snow-covered ground. He has outlived three wives but his fourth, Issem Jan, dedicates herself to helping him live as long as possible. "I do whatever I can for him. I take care of everything for him. I serve him a lot and God will give me his reward," the 70-year-old said as she massaged his legs. Chattah and nearby villages are 2,000 metres above sea level and are cut off from the rest of the country for almost six months because of the snow. The altitude also increases red blood cell production in the body, and the crisp air is free from the kind of choking pollution that blights Pakistan's major cities. Despite being a favoured tourism spot, Neelum Valley is relatively untouched by time and traditional farming methods including the use of bullocks to plough fields and minimal use of pesticides are still practised. There are no nearby markets, no fast food, and villagers are for the most part self-sufficient. "The farmers still use bulls to plough their fields. This an old system of agriculture," the headman of the village, Abdul Khaliq, 75, said. He added that young men and women get up early in the morning around 04:00 am and work till sunset, busying themselves with farm tasks like chopping wood, carpentry and tending to their livestock -- another factor contributing to their overall good health. Mohammad Shapal Khan, an senior NADRA official said that only 60 percent of the region's population had so far been added to federal data -- but each village in the valley has a dozen or so people in their nineties or hundreds. In stark contrast, the average life expectancy in Pakistan is 64 for men and 66 for women according to the World Health Organisation. The UN-backed Global Age Watch Index named Pakistan as one of the three worst places in the world to grow old in and the worst in terms of so-called "enabling environment" which includes security and freedom of movement. Sabat Khan, another elderly local who claims he is 102 although official records place him at 92, said his idyllic homeland and lack of ill-health were responsible for his long life. "It is thanks to God's blessing that I'm healthy," he said, surrounded by a multitude of grandchildren. "I've rarely been sick and now I'm an old man."